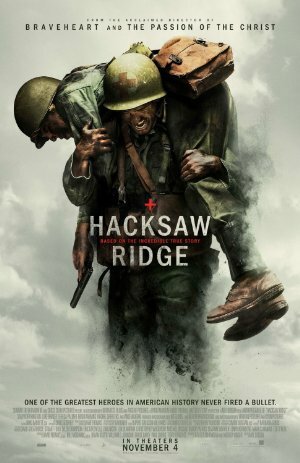 Mel Gibson returns to directing after a 10-year gap with the story of WWII "conscientious cooperator" Desmond Doss, who served as a medic during the Battle of Okinawa, refused to kill people or carry a gun, and became the first U.S. citizen to win the Medal of Honor without firing a shot. Rotten Tomatoes has it at 87% critics/95% audience. And here's History vs. Hollywood on what was true and what was invented for dramatic purpose. It's Spielbergian in its manipulation (e.g., its overbearing score making sure you feel what you're supposed to feel at each emotional beat), and Gibson's obvious fetishization of the destruction of human bodies is on full display (and, as some critics have noted, betrays the pacifist morality tale at the core of the film) , but I still thought it was one of the better war movies I've seen in, oh, the last 10 years. Most of that comes from the power of Doss's incredible, principled heroism on Hacksaw Ridge. When the movie moves past the schmaltzy 1940s smalltown setup (which I enjoyed because like all smart filmgoers I enjoy 1940s-era schmaltz) and your basic basic-training scenes (which are saved by the acting from Andrew Garfield and (god help me but it's true) Vince Vaughan)), it becomes a pretty great presentation of one of the most selfless and incredibly brave incidents you'll see in any war movie, ever. That alone makes it worth viewing, especially for anyone you know who may be a bit too addicted to first-person shooters, for example. Yes, the criticism Gibson has gotten from some reviewers for trying to both have and eat his violent cake is legit, and yes, the Daddy/Savior issues Gibson obviously wrestles with are on full display along with his fascination with gore, but I still left the theater thinking a) that was a damn good war movie and b) Mel Gibson is a more interesting director than Steven Spielberg. Curious to hear other Mefites' takes. I left the theater feeling super gross about the movie. It is perhaps the most pro-war movie I can remember seeing in the theater. I felt as if Gibson went out of his way to other and dehumanize the Japanese, and likewise went out of his way to bring religious themes to the forefront, leaving viewers with the impression that Doss and the good Christian Americans deserved victory over the vile and cruel Japanese. For a film in which I expected religion to matter quite a bit, I still found this weird, like Gibson was laying this on super-thick. I especially found the interviews with Doss and his contemporaries at the end of the movie to be manipulative: they were quite moving, for sure. But to me they stood in stark contrast to how Gibson chose to tell Doss's story, and I was left wondering if Doss were alive today whether he'd approve of the film; I imagine that he might not. The syrupy 1940s small town love story that took up the first chunk of the movie wasn't anything special, but maybe the best part of the film. It seemed like the basic training part could have elevated the movie, but something about it didn't click, and I grew enormously tired of the court-martial and everything else that weighed down the middle of the film. His basic training company seemed straight out of central casting from a 1950s-era movie. Indeed, the movie I was most reminded of for much of the film was the very earnest and medicore 1955 Battle Cry. The only cliche Hacksaw Ridge was missing was a scene where the company bonds during a barroom brawl (actually, is it possible the film had such a scene? I feel so much that it should have, that now I wonder if perhaps it actually did). The tl;dr version of my takeaway from this film is that it is indeed the case that Vince Vaughn was the best part of this movie, and that tells you pretty much everything you need to know about it, I guess. The relentless graphic violence clashes with a film about a staunch pacifist. What I found the most offensive was that after his act of heroism on the ridge, he's sitting back at camp and the Captain comes over and explains that he understands him now, and respects him, and by the way could he see his way clear to not observing his Sabbath this week because the men won't go and kill all the enemies without him. It reduced him to a mascot and a totem of the troops, not a man who stood for what he believed in the face of incredible pressure from his own side, and then committed an amazingly brave act, saving 75 men who had been left to die. While I had been mildly irritated for the movie mixing the loving cinematic treatment of the battle sequences with the fact that the main character was devoted to a life of non-violence, I felt that conversation and the way it was portrayed pushed the character into a deeper betrayal of his beliefs than him using a rifle on the target range would have.